Today marks a significant milestone in the construction of Royal Caribbean's fist Quantum Ultra-Class ship. The first block of the ship was lowered today during the keel laying ceremony. 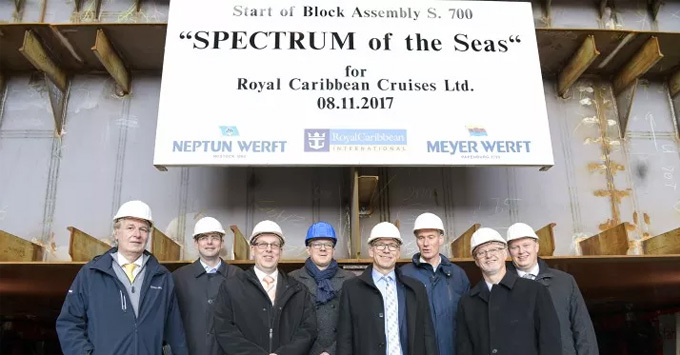 They ceremony took place at the Neptun Werft shipyard in Rostock-Warnemunde, Germany. Today the first of 74 blocks was laid and marks the official start of construction (even though construction actually started back in August when the first piece of steel was cut). Two Royal Caribbean representatives were there to carry on the maritime tradition of placing a lucky penny under the block before it was lowered. Spectrum of the Seas is set to debut in the spring of 2019. The 168,666 ton 4,200 passenger cruise ship has been designed to appeal specifically to the Chinese market and Asia-Pacific region.